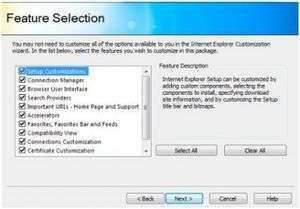 The Internet Explorer Administration Kit (IEAK) 9 simplifies the creation, deployment and management of customized Internet Explorer 9 packages. Version English is a freeware program which does not have restrictions and it's free so it doesn't cost anything. For security reasons, you should also check out the Internet Explorer Administration Kit 9 download at LO4D.com which includes virus and malware tests. Additional screenshots of this application download may be available, too. Internet Explorer Administration Kit 9 has a presence on social networks. Internet Explorer Administration Kit 9 download been highly rated by our users.